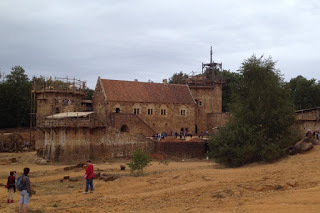 Blog - Guédelon - Welcome to the thirteenth century. 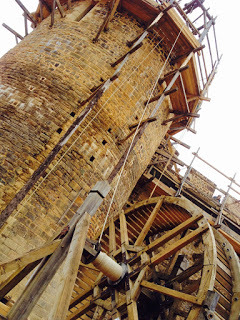 When you first arrive at Guédelon, you don't see the castle straight away, but even the most mildly attuned will certainly feel it, the sheer creative energy of the place reverberates through the surrounding woodland like a drum! As you walk towards the site, you gradually become aware of the rapid 'tick, tick, tick' of masons chisels on stone, then the slower 'ting.. ting.. ting' from the blacksmiths shop. The creak of handmade hemp ropes taking the strain is gradually joined by the smell of oak and the damp earth beneath your feet. You are literally walking out of our sanitised, air conditioned, plastic world and into 13th century reality. 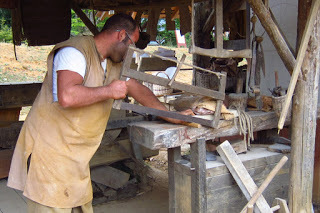 Guédelon is a 25 year scientific and experimental archaeology project. It's not archaeology in the sense of digging up artifacts and analysing them, instead this audacious project seeks to recreate a complete quarter decade of the past intact, and with it challenges faced by craftspeople from 1242 to 1267. By applying the solutions that we know they had available at the time, historians are able to find the gaps in our knowledge, deliver reasonable suggestions for how the remaining problems might have been overcome, and then test them within the context of the time. This is especially interesting for me, because the only production methods available at the time were hand crafts. The thing that struck me most deeply during the visit was the level of interdependence between the many crafts. Imagine a musician, who had only ever heard snippets of individual instruments played solo, suddenly walking into the Royal Albert Hall with the London Philharmonic in full flow and you begin to get an idea. 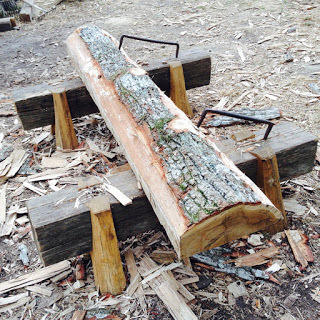 The woodsmen would select, fell and square timber for the carpenters, cartwrights and millwrights using axes and dogs forged by the blacksmith, using charcoal supplied by the woodsmen. 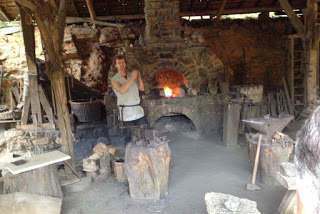 The millwrights would use the wood to build a mill to grind the farmers' wheat for the baker to make into bread using a hearth lined with tiles made by the tiler and a table made by the carpenters so that everyone could eat. We all know that occupational surnames like Smith, Tyler, Carpenter, Wright and Baker are rooted in the crafts, but when you stand in the middle of a complete working community you realise how and why they became surnames. These were not just jobs, everybody made something and what they made completely defined their existence, as well as their place within the community and wider society - for generation after generation. In my day job at Workshop Heaven I often meet people who harbour an inexplicable but long held yearning to make things with their hands. I Now understand why that feeling exists. We have spent thousands of years evolving into a species of makers, it is a fundamental part of our genetic makeup that transcends borders, language and cultures. It is, in essence, what we are. The crafts themselves have changed very little and were already long established by the 1240's. Chatting with the Blacksmith he explained that the fundamental skills of the craft (drawing down, jumping up, punching, cutting and fire welding) equipped him for everything that had been tasked with at Guedelon, it was just a question of working out how to apply them to the job at hand and taking as long as it takes. The biggest hardship for the smiths was the lack of flat material to work with. The bloomery iron that would have been available at the time comes as a lump, so if you want sheet, you need to first beat it flat by hand before you can begin. The Castle builders' main tools were the plumb line, the level (plumb line on a frame) and the thirteen knot rope, a deceptively simple tool that can be used to form a variety of surprisingly accurate geometric shapes. Examples of all of these have been unearthed at the pyramids, built some three and a half thousand years earlier, (when you have just stepped back in time by 750 years, another 3500 seems like a very long way indeed). Ironically, at exactly the time Guédelon would have been under construction, the pious French King Louis IX was extending the crusades into Egypt - there's gratitude for you! 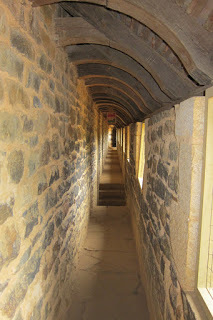 If you would like to visit Guedelon for yourself, it is a couple of hours south of Paris in the Treigny area . 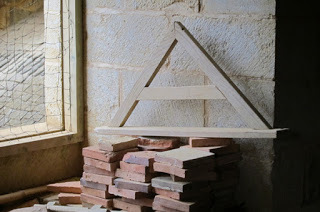 Details can be found at http://www.guedelon.fr/en/. The site is open every day except Wednesday until the 3rd of November 2015 and re-open's next March. Tours are conducted in French, English, Dutch and German.